I stepped out of my comfort zone with this review. Adam Cesare is a well known indie horror author and YouTube vlogger. I wanted to do a little something that Adam would appreciate. I made a YouTube channel and recorded a review video of Zero Lives Remaining. If you guys like it please subscribe and like the video. 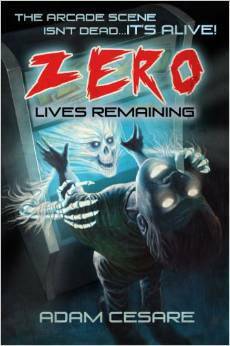 Also, you really should read Zero Lives Remaining if you like nostalgia with your horror. Thanks for viewing the video. It is my first one, so there’s room for improvement. As always, thank you! He’s a ghost in the machine, keeping a watchful eye on the arcade where he lost his life two decades before. And the afterlife is good. The best thing ever to have happened to him. But when the conscious electric current formerly known as Robby Asaro makes a decision to protect one of his favorite patrons, Tiffany Park, from a bully, he sets loose a series of violent supernatural events that can’t be stopped. Trapped inside the arcade as the kill count rises, Tiffany and a group of gamers must band together to escape from what used to be their favorite place on Earth…and the ghost of Robby Asaro. From the author of Tribesmen, Video Night, and The Summer Job, Zero Lives Remaining is a masterful mix of horror and suspense, dread and wonder, a timeless ghost story that solidifies Adam Cesare’s reputation as one of the best up-and-coming storytellers around. This is Adam Cesare firing on all cylinders—and he’s just getting started.